Daventry Town manager Darran Foster will be looking for his side to bounce back when they entertain Tividale at Communications Park tonight (Tuesday). Two second half goals from Deon Meikle and Reuben Wiggins-Thomas ensured Basford United stretched their unbeaten Evo-Stik Northern Premier League run to five games as they completed a comfortable 2-0 victory at Daventry Town on Saturday. Manager Darran Foster included new signing and former striker Mitchell Piggon on the bench for the Division One South clash. 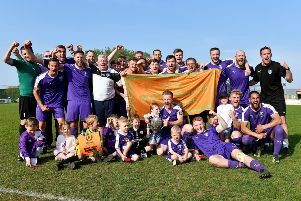 Basford dominated possession, producing a fast passing game and Daventry could have been three goals down by the interval but for keeper Ben Heath. Basford centre back Dion Miekle scored his second goal of the season to put Basford ahead and Ruben Wiggins-Thomas scored his seventh league goal of the season to give Basford the victory they deserved. Meikle was denied by Heath who then thwarted Wiggins-Thomas. Former Nottingham Forest winger Eugen Bopp provided a perfect cross for Corey Grantham right in front of goal but the former Ilkeston striker could only hit his shot over the bar. Heath kept out Josh Thornton’s specualtive drive while Adam Creaney came closest to scoring for Daventry in the first half when he latched on to a rebound but fired wide. Thomas–Wiggins should have put United ahead when met the ball at the far post but he headed the ball down past the upright when he should really have tested the keeper. Heath came off his line once again to save at the feet of Grantham as United piled on the pressure further. Basford deservedly broke the deadlock two minutes into the second half Meikle latched on to a pass from Billy Bennett to beat Heath. Ricky Hill came closest with a couple of headers before experience and class showed for Basford’s second goal in the 64th minute when Bopp waltzed past several defenders before laying the ball back into the path of Wilkins–Thomas who stroked the ball home past Heath.